We just came home to St. Thomas after three profound weeks of sailing camps in St. Vincent and the Grenadines as well as an international regatta in Carriacou, Grenada to wrap it all up. While, we were down there my computer charger took a dive so I wasn’t able to properly send any of these blog updates. My thought now is that rather than sending all at once, I will write to you in chronological order, backdated- like a captain’s log almost. For a fun recap of our week… check out this video compilation put together by our amazing friend and photographer William Torrillo. 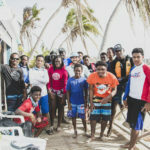 We just completed a week long camp on the island of St. Vincent in collaboration with the St. Vincent and the Grenadines Sailing Association (SVGSA). The camp was run out of Paradise Beach Hotel on the Southern tip of St. Vincent, just across from the picturesque Young Island. This camp had a massive turnout of participants with almost 30 in total coming throughout the week- the vast majority of which had never sailed before. While this was more than the normal size of our groups, we learned some valuable lessons on how to pull off a camp of this size. The biggest of these has to do with the sailor to coach ratio. 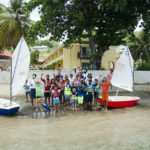 Without the help of the more experienced young sailors from Bequia: Jamark, Eltino, and Jordan; coach in training, Jojo Adams; and coach/super-hero, Eddie Brown, this camp of 30 beginner sailors would have been total chaos. However, with these guys at our side we were able to deliver a truly great week of sailing instruction and smiles for all. 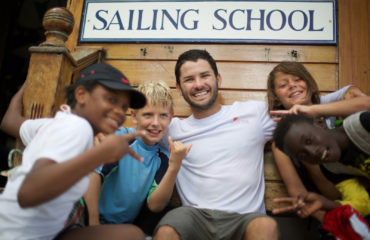 Additionally, having the young Bequia sailors on staff allowed us to really work on one of our main goals: supporting and cultivating local coaches. Favorite moment: Taking all of the sailors across the small channel to Young Island, pulling up the boats, and doing some tai chi! 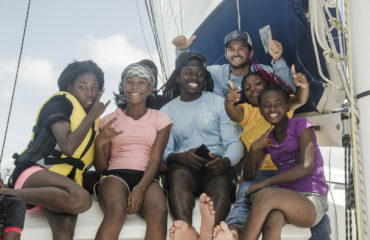 The Bow Sailing Team that delivered such great instruction both on and off the water: Lukata Samuel, Elizabeth Nurse, and photographer William Torillo. The St. Vincent and the Grenadines Sailing Association for hosting us and taking care of all the organization. 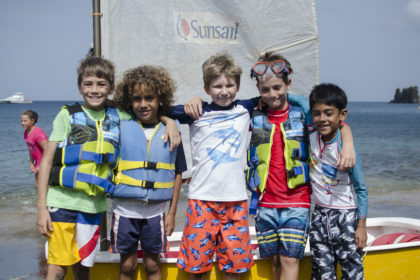 SVGSA is a recently established, and World Sailing recognized, sailing organization. It was amazing to work with this group. They have big aspirations for the region and we are excited to collaborate more on the joint mission of sailing development. The Bequia boys/coaches for their assistance and enthusiasm! Individuals Kelly Glass, Simon Carey, and Michorne Weeks for the continuous support throughout the week to make the camp run smoothly and for making us feel so welcome and appreciated. We look forward to another St. Vincent visit soon!